Unifor President Jerry Dias: Promises "one hell of a fight" with GM in Canada. He's pictured here speaking to GM workers in Oshawa earlier Monday. WASHINGTON — The head of Canada's largest autoworkers union wants Prime Minister Justin Trudeau to borrow the tactics of the U.S. president and get tough with General Motors, Donald Trump-style. 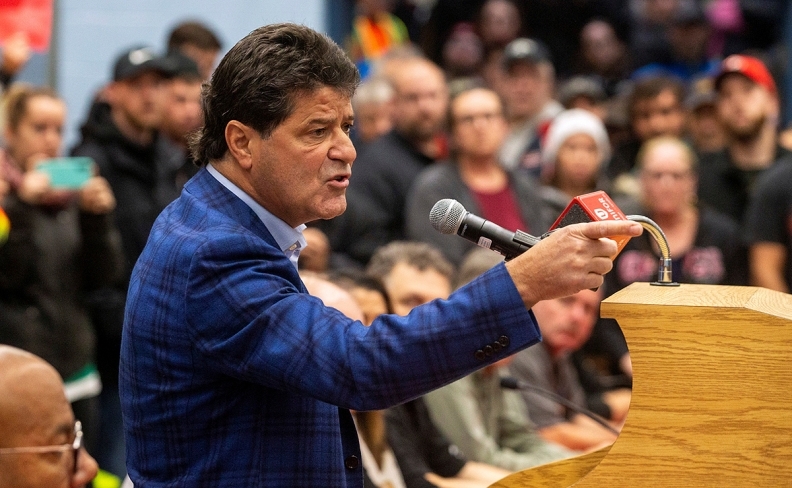 Unifor president Jerry Dias is also urging both countries to hold off signing the new U.S.-Mexico-Canada Agreement on trade and to join forces on a 40-per-cent tariff on GM vehicles built in Mexico. He wants the company to reverse plans to cut more than 14,000 jobs, including 2,500 production workers in Oshawa, Ont. "I think both Canada and the United States should put the brakes on immediately," Dias said as he arrived at the Canadian Embassy in Washington for a meeting with officials to discuss next steps. In addition to mothballing the Oshawa plant, the cuts involve shutting down production at four facilities in the U.S, including in Ohio and Michigan. GM plans to end 3,300 production jobs south of the border and do away with 8,000 salaried workers, all in the name of US$6 billion in savings by 2020. It's a sign of more to come, said Dias — GM is clearly focused on moving its manufacturing work away from both countries, including moving work to Mexico and China, which means job losses will continue unless both Canada and the U.S. ramp up the pressure. A hefty tariff on Mexican-made imports would "get their attention immediately," he said, even as he acknowledged the contradiction between battling U.S. tariffs on steel and aluminum on the one hand, and joining forces in a similar tactic on the other. "It sounds bold, it sounds aggressive, it's not productive — but we're dealing with a corporation that doesn't care," Dias said. "They've watched all this unfold, they listened for 15 months and they don't care. This is all about their shareholders, it's all about the board. It has nothing to do with people." Flavio Volpe, president of the Canadian Automotive Parts Manufacturers Association, said while he understands the union leader's frustrations, adopting Trump's hardline tactics would be a grievous tactical error at a time when Canada is trying to negotiate a solution to its own tariff impasse with the U.S.
Canada remains subject to Trump-imposed tariffs — 25 per cent on steel exports and 10 per cent on aluminum — that the U.S. claims are justified on the grounds of national security, and that auto-industry experts acknowledge have made it more expensive to build cars in both countries. They're called "Section 232 tariffs," for the part of an American trade law that allows them. "You can't be hoping for the benefits of the USMCA, fighting Section 232 tariffs and endorsing company-specific tariffs at the same time," Volpe said in an interview. "Jerry is a very important and positive part of the Canadian automotive fight, but that tariff idea is wrong." Trump, whose 2016 election victory came in large part from blue-collar supporters in the U.S. Midwest who cheered his promise to bring jobs back to the hard-hit manufacturing sector, has threatened to withdraw support for GM if it didn't reverse course. He doubled down on that threat Wednesday, saying the General Motors cuts have prompted fresh discussions about slapping tariffs on auto exports. "The president has great power on this issue," Trump tweeted. "Because of the GM event, it is being studied now!" The Trump-christened USMCA, increasingly known north of the border as the "new NAFTA," is due to be signed later this week when world leaders gather in Argentina for their annual G20 meetings. That signing is widely expected to go ahead despite the outstanding tariff issues. In announcing the cuts Monday, General Motors said its retooling is part of a dramatic course correction to position the company for the coming dominance of electrified, interconnected and automated automobiles. There's no reason why that work can't happen in Canada, Dias said. "They're not talking about transforming from cars to spaceships. It's still a car; it's the exact same car, it's just got different technology inside of it," he said. The company launched a high-tech research centre last year in Markham, Ont., not far from the Oshawa plant, he added. "Certainly they can develop that technology, and then implement it in a car they're assembling five miles down the road."